Need caffeine on campus but don’t know where to go? Once that afternoon fatigue rolls in, many students are itching for their next fix of caffeine. 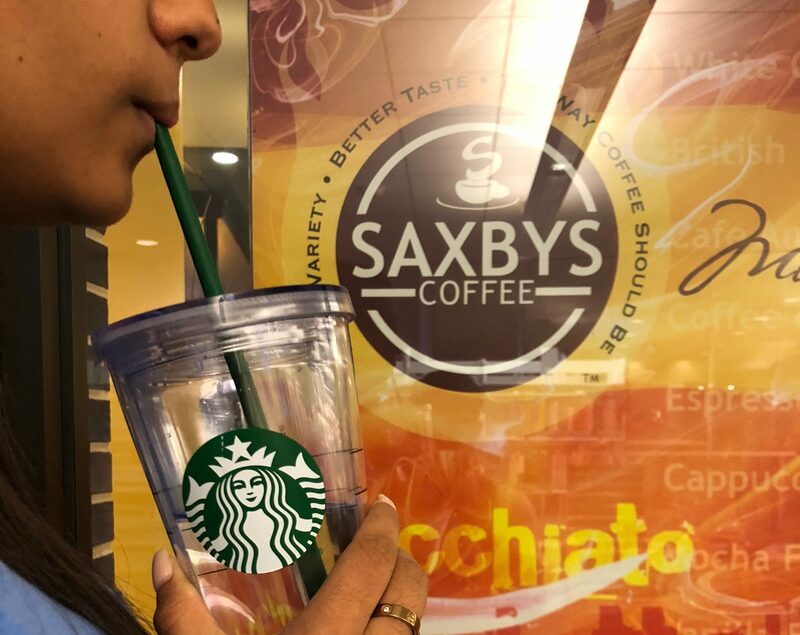 While there are many options both on and off campus, two of the most popular on-campus coffee shops are Saxby’s and Starbucks, but how can you be sure which one to pick? Luckily for you, The Signal analyzed them both to compare prices, atmosphere, accessibility and more to determine your best pick. Check out these competitors side by side to figure out where you should get your next chai latte. Mon-Thu: 7:30a.m.-11p.m., Fri: 7:30a.m.- 6p.m., Sat: 12p.m.- 6p.m., Sun: 12p.m.- 8p.m. Saxby’s is located conveniently inside Library North. Enter the library and it’s immediately to your left. While there are a few Starbucks around the downtown area, the closest to campus and the one we will be discussing today is located across from Kell Hall in the Hurt Building. If you’re into a chill, traditional and 90’s styled cafe, look no further than Saxby’s. Compared to Starbucks, Saxby’s offers more freshly made food, such as sandwiches, oatmeal and smoothies but still with the pastries and drinks you’d expect to find at a traditional coffee shop. Saxby’s has both tables and large couches around a TV, perfect for any group meeting. While they do have a lot of different seating (60, to be exact), they don’t offer quite as many outlets, with only one being available for every other seat. If you’re looking for a space to meet with a lot people, Saxby’s offers a large table that seats 16. Unfortunately, since it’s located inside the library, there are no windows and no natural light. The closest bathroom is located outside of the Saxby’s and on the first floor of the library. Starbucks lacks freshly made food but they offer more drink specialization and more packaged snacks for on the go. As for atmosphere, Starbucks is the more modern choice. It was just recently built, so they offer more outlets and include many large windows with plentiful natural light. Starbucks is designed like traditional, industrial lofts, with an open floor plan surrounded by metal accents and modern, trendy decor. They offer 42 seats with tables, booths and plush arm chairs to enjoy your drink of choice. This seating is complemented by outlets conveniently scattered around the store. Because it is such an open store, there is often crowding during peak hours and sound carries throughout, making studying a bit harder if you need silence to concentrate. While there are a lot of smaller, two-person tables offered, their biggest table for group projects seats four. They also offer a bathroom to customers, including a baby change station. Because Saxby’s is located inside Library North, it can be difficult for those in wheelchairs to access. To enter the Saxby’s, take the Library Plaza elevator into the plaza and enter through the normal doors. Thankfully, the Saxby’s is on the first floor. During peak hours, the library will often display a line of students waiting to use the fingerprint scanners to enter, as well as a line of people waiting to order in the Saxby’s. Because of this, there are two lines you must endure before access to your favorite stimulant. The main entrance for the Starbucks is located up a flight of stairs inside the Hurt Building. For people in wheelchairs, access the store by going around to the side street, Hurt Plaza across from Kell Hall, and enter by cutting through the Hurt Building lobby. During peak hours, the entrance of the Starbucks becomes full as the line often extends through the store, down the stairs and out onto the sidewalk.